The era of the iPhone is waning. Most of us don't care about upgrading to Apple's "latest and greatest" smartphone, especially when it's costing us $600+ and the features are no different or any more cutting-edge than the previous generation. Apple's upgrade cycle evokes a lot of resentment from the iCommunity; many people feel shut out by the prohibitive cost and are opting to keep their old phones longer. The problem with our smartphones today is they’re bound by the restraints of their design, form, and hardware; you can either upgrade the whole, or don't upgrade at all. But what if there was a phone you could upgrade piece by piece, exchanging the internals when needed, customizing it on your own terms to meet your specific desires? What if it was cheaper, stronger, and had a longer shelf life than your current or next-gen iPhone? Modular phones -- like Google's Project Ara and the LG G5 -- represent a very real opportunity to seize back control over our devices. With swappable "modules" that slide into the phone's design, they allow users to upgrade hardware without having to buy a brand-new phone, opening up potentially endless personalization options. Seriously, you can practically build your very own phone. 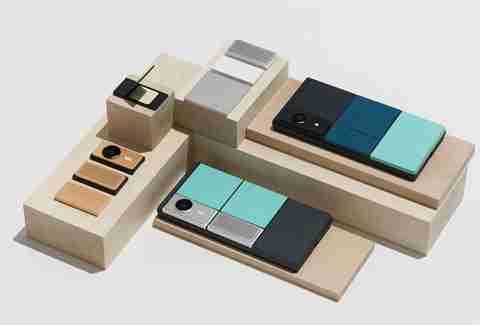 Modular phones transform the consumer into a mobile architect. Think of it like a LEGO set you're filling with high-tech building blocks. Modular phones can be customized with individual pieces -- attachable hardware called "modules" -- to enhance overall performance and deliver slick new features. So, for instance, imagine being able to add manual camera buttons or change out lenses to shoot DLSR-like photos and videos. Install extra batteries before you travel to keep your phone running for days. Throw on a speaker system before you head out to a party. Ditch the iCloud and expand GB capacity to store your entire media collection. It sounds like a dream, but the technology is already here. 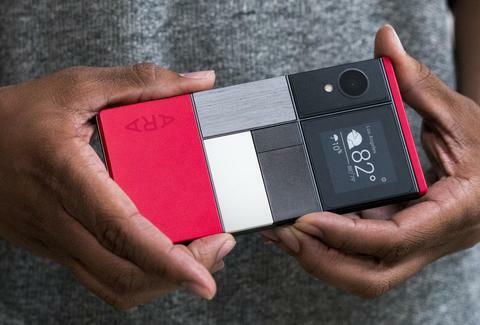 Google was first on the modular-phone scene, spending the past three years going through failed prototype after failed prototype for what has been dubbed Project Ara. The phone is finally targeted for a 2017 delivery date. 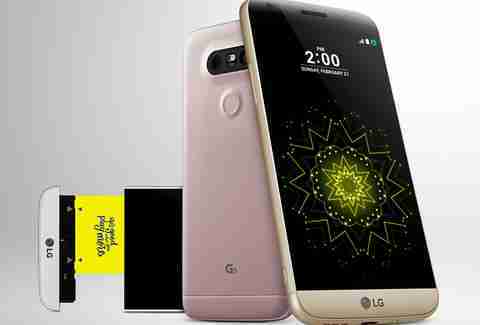 Meanwhile, other companies caught up to the internet leviathan, with LG recently launching its own take with the G5 and Motorola following suit in the coming weeks. This is only the first stage of what could (and should) become a very cool thing as the technology continues to advance. The LG G5 reviews are mostly favorable, except that the modular adaptation feels clunky and gimmicky, and the accessories add a lot of heft. Yet you can't help but hear a bit of Apple in this criticism; the Cupertino design ethos has convinced us that our phones should be shiny, smooth, lightweight luxury items. It's that same design ethos that has led to frustratingly dysfunctional products like fraying charging cables. Imagine the possibilities and increased functionality if we were willing to abandon the sleek uniformity of the iPhone and embrace a little bulk? Here's a look at what's on the market now, and what's coming on the horizon. With an aluminum unibody and super-fast Snapdragon 820 chip, the G5 looks no different than your standard Android phone. That's until you access the camera and play with its insane 135-degree wide-angle lens, which produces a field of depth wider than what your eyes can register and delivers better detailing than the iPhone 6s. The CAM Plus module doubles as a manual camera control, and the Hi-Fi Plus, made by Bang & Olufsen, is a portable DAC for hi-res audio. 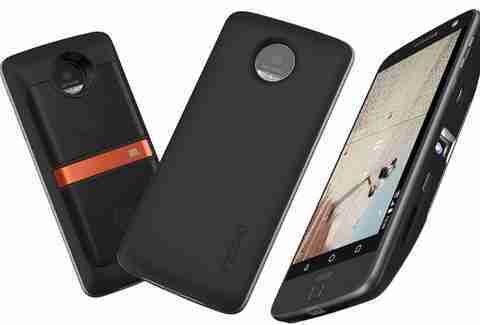 Motorola will release two phones exclusively on Verizon this fall that feature their own swappable hardware. The Z and Z Force tackle a more streamlined approach to modularity, with magnetic connectors that accept three add-ons called Moto Mods: a slim battery case that packs up to 22 hours of juice, a projector to broadcast content at a 70in range, and a speaker accessory with powerful stereo sound and built-in battery. Not exactly items you'll find in the Apple Store. 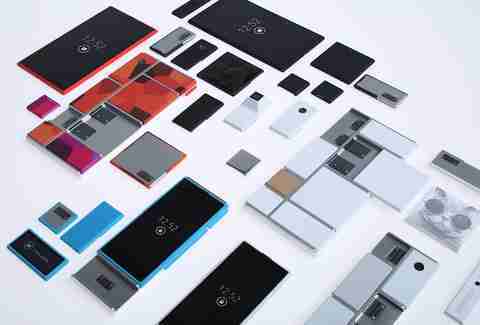 Project Ara has been scaled back from its original concept. Still, Google's set on creating a hardware ecosystem that measures up to the Android app ecosystem. It's designed a collection of modules consisting of expandable memory, loudspeakers, a monochromatic display, and several other goodies that plug into the phone's six rear slots without shutting the power. This level of customizability makes it the most enticing of the batch, and if executed properly, could change the smartphone landscape forever. Will modular phones be the future of mobile or the next tech flop? The biggest concern facing LG and Motorola is limited modularity -- whether they can make and sell enough modules to keep the public satisfied. It's a huge gamble, one that Motorola's parent company, Lenovo, is banking on as it sets aside $1 million in equity funding for the person or company that creates the best Moto Mods prototype. LG's also opened up its platform for developers to build custom hardware compatible with the G5. Meanwhile, all three mobile-makers continue to generate interest from other tech manufacturers -- Google alone has already courted Harman, Panasonic, Samsung, Sony Pictures, TDK, and several others to jump on board with specialized modules. These phones are just appetizers for what could very well be a complete mobile game-changer. For those of us caught in Apple's web, a major luring factor will be price. The initial price differences between these phones and the iPhone isn't that great, but it's escaping the annual upgrade cycle that will reap the biggest returns. In the end, it's cheaper to replace the parts individually rather than drop several Benjamins on a brand-new iPhone every one to two years. Not to mention the money you'll save replacing shattered screens. If the modular blocks fall into the right place, we all might be ditching Apple's bandwagon very, very soon.